Start of footwork warm-up for an Intermediate Foil class. Our Primary Course introduces you to fencing in four one hour sessions covering fundamental skills. In the first session you choose the foil, epee, or sabre, and will work with that weapon throughout the course. The Primary Course is designed to help you decide whether fencing is a sport you want to pursue, and if so, to move you quickly into our Intermediate modern fencing program. Our modern fencing program is the major focus of the Salle. Musketeer Epee: Our Sunday afternoon program for fencers age 10 and under, Musketeer Epee provides beginning level technique development, movement skills, training in the self-discipline needed to be a fencer, and plenty of opportunity to fence in a safe and well supervised environment. Intermediate Fencing: The majority of our instruction is done through our Intermediate Program, with two group classes available in each weapon each week. Group classes provide an important part of a fencer’s development through structured instruction and drills to develop technical and tactical skills. Although titled Intermediate, the focus is on development of a full range of skills from fundamental to the most current advanced competitive. Advanced Fencing: For the individual interested in competitive success in modern fencing, we offer our Gold Program. This program is tailored to the individual fencer’s training needs and includes the full range of group classes, 3 and 5 Minute Lessons, longer individual lessons, solo training, and support services. The specific individualized content of training is determined by the experience, technical and tactical sophistication of the fencer, and short and long term goals as applied in a periodized training and competition program. Competitive fencing for athletes with disabilities dates back to the 1960s with the start of wheelchair fencing. Today US wheelchair fencers compete in national tournaments and represent the United States in international competition and the Paralympics. Compettive fencing for the blind is in its infancy in the United States, but is actively being developed in four countries in Europe. Salle Green is prepared to work with any wheelchair or blind athlete interested in learning to fence. Classical fencing is fencing in the style of the period 1860 to 1939 with a emphasis on the variety of blade actions and with less emphasis on complicated footwork, distance, and timing actions. We teach foil, epee (dueling sword), and sabre, using period fencing manuals as the basis for instruction. Instruction is by appointment. Historical Fencing includes fencing using the weapons, techniques, and tactics of the Middle Ages, Renaissance, and Enlightenment. Our historical fencing program is conducted in conjunction with the Center for Historical Fencing in support of the Center’s research activities. Admission is selective and at the discretion of the Center director. 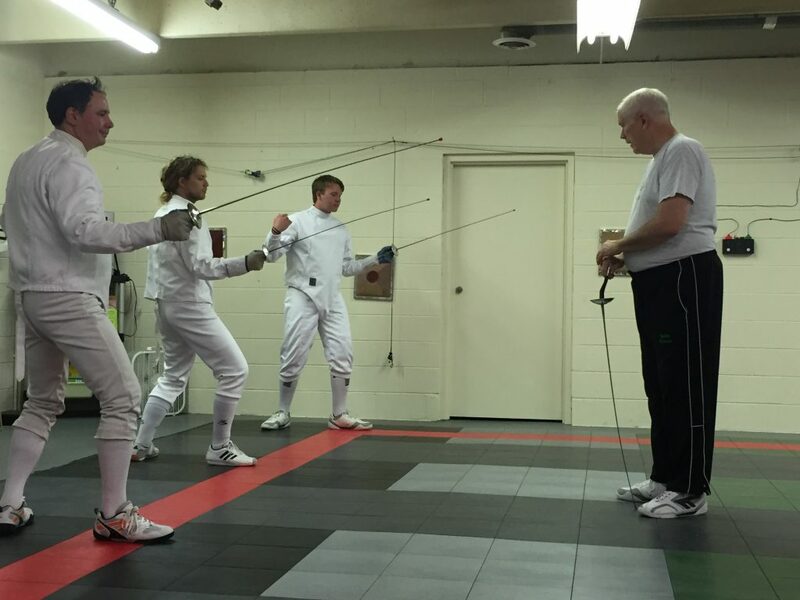 The Salle regularly offers on day clinics to train fencing coaches in preparation for the Assistant Moniteur, Moniteur, Prevot, and Maitre certification examinations of the United States Fencing Coaches Association. The Salle also teaches the preparation courses for Classical Fencing Demonstrator, Instructor, Provost, and Master credentials of the Classical Academy of Arms.